Bravecto 1400mg Chewable Tablets for Extra Large Dogs are a new innovative treatment for flea and tick infestations in dogs weighing 40-56kg. 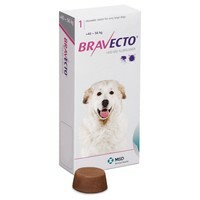 Quickly and effectively killing fleas and ticks for up to 12 weeks in a single dose, Bravecto Chewable Tablets contains the active substance Fluralaner; a new extoparasticide belonging to the isoxazolina group. Bravecto Tablets eliminate up to 99% of the fleas and ticks on your dog within 8-12 hours and 100% of them within the 12 week period. The tablets can also be used as part of a treatment strategy for the control of flea allergy dermatitis (FAD).